The Dalston Peace Carnival Mural has been restored after several months of work and extensive planning. 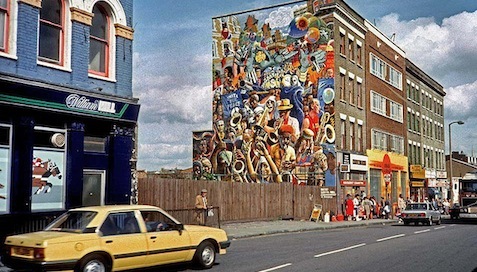 The mural, originally designed in 1983 by Ray Walker, had been gradually coming away from the brick building at 15 Dalston Lane. 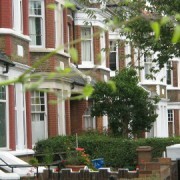 Holes were carefully drilled in the brickwork before mortar was pumped through to securely attach the artwork to the wall. The mural was also cleaned, repainted, and sprayed with an anti-graffiti coating to prevent the absorption of unsolicited paints. 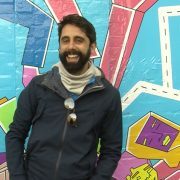 Councillor Guy Nicholson, Cabinet Member for Regeneration, said: “The Peace mural has become one of Hackney’s iconic landmarks recognised the world over as a powerful statement about how people can live side by side as a tolerant, generous and peace loving community. The work of art, which depicts a scene from the 1983 Hackney Peace Carnival, was one of six works commissioned by the London Muralists for Peace. Walker unfortunately died before the mural was finished; his wife Anna and friend Mike Jones ultimately carried out his vision. Paul Butler, who restored the Cable Street Mural in Shadwell in 2011, was responsible for repainting the Dalston Peace Mural this summer. Located across from Dalston Square and the Dalston Junction overground station, the artwork has become a landmark since its completion. It gained even wider exposure in recent years, when it was featured on Rudimental’s album cover for Home.